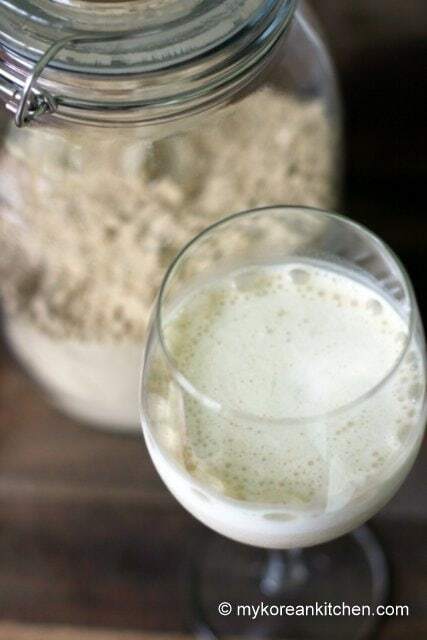 Easy homemade breakfast drink! 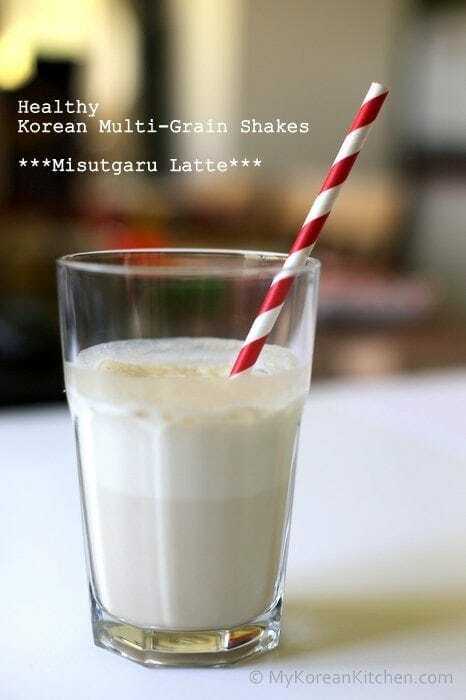 Healthy Korean multigrain shakes – Misugaru Latte (Misutgaru Latte) recipe. When I was in high school grade 12, my life was pretty hectic. I got up at 6 am in the morning, left home for school around 6:50 to 7 am, arrived at school around 7:30 am and stayed there until 11pm, studying. Can you believe that? I know I wasn’t the only one who had to stay at school for those crazy hours, but still you really need a good balance of food to keep you going or “survive” I would say. I always tried to get a proper breakfast – rice, soup and side dishes – a typical Korean breakfast. But if I got up late and I didn’t have enough time to have my breakfast, my mum always handed out this multi-grain shake (Misutgaru Latte or Misugaru Latte if you already tried it from Caffe Bene) to me at the door. Misugaru (미수가루) or Misutgaru (미숫가루) is a mixed multi-grain powder that is ground, roasted and/or steamed. It is high in protein with relatively low calories, so it is popular among people on a weight loss diet. It certainly kept me going longer than a rushed regular breakfast I had while I was at school. 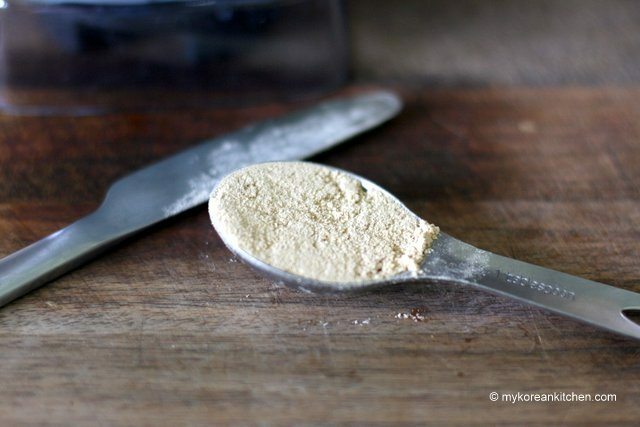 This is what the misugaru / misutgaru powder looks like. The package I bought was produced by the local rice cake mill store (떡집/방앗간). I personally think this is the best kind you could get, as it omits artificial additives. This yellow sandy colour bag of Misugaru was AUD $7 and I purchased it from a Korean grocery store in the Brisbane CBD. It is also quite common to take your own choice of grains to the rice cake mill store and ask them to make a powder for Misugaru. This way you can choose your own grains for whatever % components you would like. After opening the packet, I keep Misugaru in an air tight glass jar. Some Misugaru comes in a resealable packet. Regardless, Misugaru can be kept in the freezer for more than a year without getting spoiled. Add some water or milk. For my recipe below, I wanted to recreate the Misugaru latte I used to drink when I was at high school. I hope you find it delicious and filling! Enjoy. 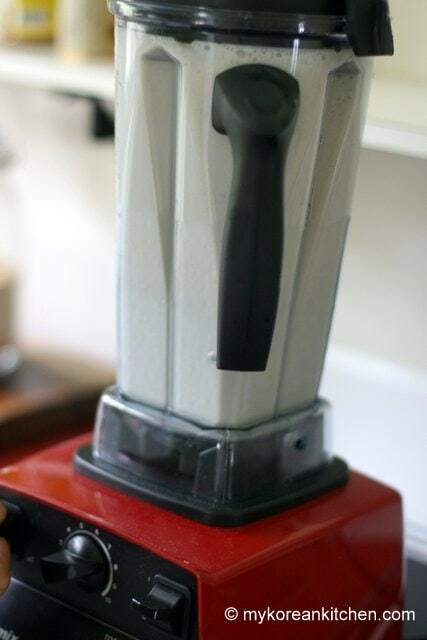 Add above ingredients into the blender and mix well. 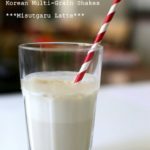 Healthy Korean Multigrain Shakes - Misugaru Latte (Misutgaru Latte) Recipe. After reading this a while back, I found it at the local Korean shop, Happy Market at Runcorn, $10 for 900 g /2 lbs. Have been using this now for a while, especially as ‘breakfast’ before I rush off to work, instead of Up&Go. 2 heaped dessertspoonsful and 2 of honey with one heaped cocoa powder (there is a very rich looking dark cocoa powder, unsweetened, you can find in Woolworths in the cooking section (it’s not in the coffee/tea section which only has the usual stuff) with a medium sized glass of milk makes a lovely ‘thickshake’. (Just tried replacing half the milk with apple juice, nice but too sweet…) But the misugaru is only ~6% protein. I see the local Coles (Garden City Shopping Centre @ Upper Mount Gravatt)) has whey powder in their new quick foods section, $12 for ~ a kilo I think, thought maybe I could add that to the misugaru, but that would probably make it taste like cardboard.. — but is there a Korean high-protein powder I could use ? Thanks for your answer, sorry it’s been a while before I checked back. The chia seeds sound like a good idea, they make water go gluggy don’t they ? 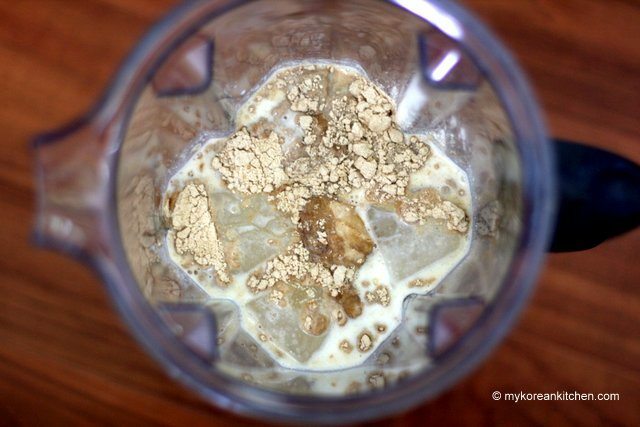 so could thicken the shake and add more protein, as you suggest. 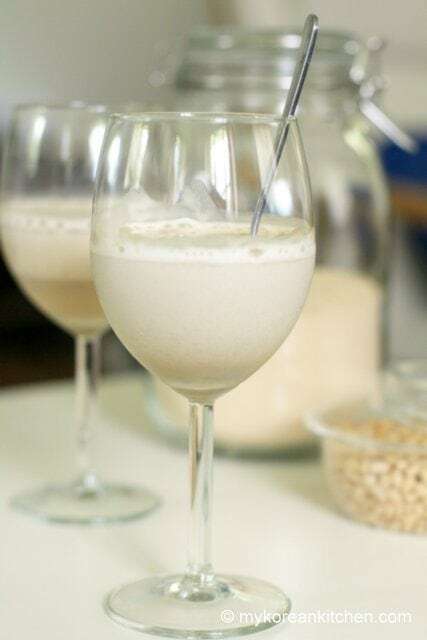 Perhaps if I mix the chia seeds with say half or third of a glass of apple juice, then mix in the misugaru powder and cocoa, omitting the honey since the apple juice is so sweet. I’ve noticed on close inspection there are quite a number of different misugaru packets at Happy Mart with differing ingredients, and maybe more choices further up the road at Luckkky’s ( 럭키식품 ) at Eight Mile Plains, and now I’ve noticed many Chinese ones also at the Chinese food store at Sunnybank Hills Shopping Centre. Many have fruit and vegetables listed in their ingredients also, although I assume those would only be tiny amounts, given the number of different ingredients listed, and that you only get one or two kilos in a packet. Since it is nearly winter, I’m looking at the ones with black sesame particularly (black > good for kidneys – winter fare )..
What is the nutritional value of the product I have high cholesterol and and looking for natural foods to take to lower it. Would this help? Just bought a green bag and don’t know what to do with it! Did you buy a pack of Korean multigrain powder? The ingredients and the composition of this powder vary widely depending on the manufacturer. It’s best if you work out the nutritional value yourself. thank you so much for the post (and the whole website)! Do you by any chance know what exactly Gogmul is and where I could get it? Gogmul implies multigrain, so misugaru would fit into that category. The powder composition will vary depending on the manufacturers, so each misugaru package tastes slightly different. (Some will also add sugar and others no sugar etc.) My mum used to handpick her selection of grains and ground it at a rice cake store/gristmill. And these were the best tasting misugaru! 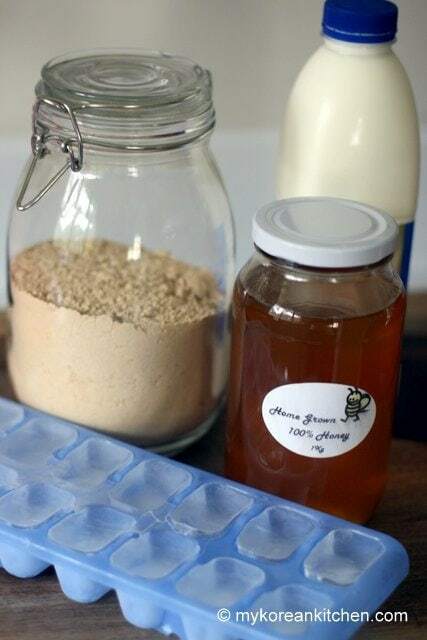 Also, when you make a shake, it will taste different if you use sugar vs. honey and milk vs. water as well. Thank you for the post! Do you think I can find it in Perth? So happy to hear that, Dana! Thank you for your interesting Misutgaru post! I am from Switzerland and as I don’t want to order a product from the other side of the world, I would like to make the powder myself. Can you find out what are the exact ingredients, composition in % an how to make it from grains? Maybe in a Corean book ;)? Woud be very happy if you could help me. Hi Carlo, sorry for the late reply. I actually don’t know how to make Misutgaru powder. The ingredients and composition varies depending on individuals taste. I also haven’t encountered the recipe for it either. Though, one day I’ll make it myself. Then I will share my recipe with you. Thanks. Hey!!! I was wondering if you can tell me more about the various amount of benefits of this drink, health/beauty-wise ! Thank you!! 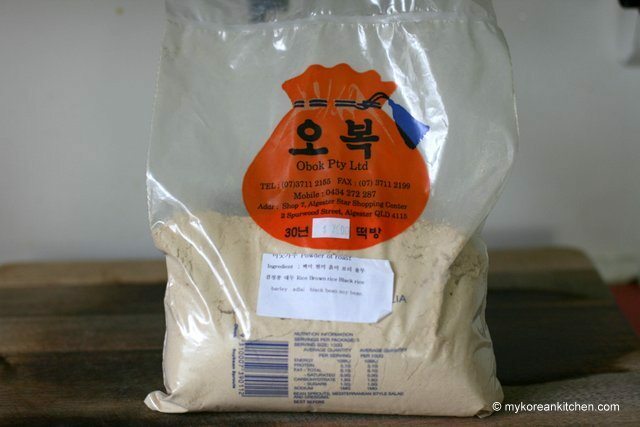 What’s the name of the Korean store in Brisbane where you purchased the multi grain powder? Hello! I recently went to Lotte Asian market and ask the guy who work there for Multi-Grain powder but instead he give me Multi-Grain Flour. Should I have ask him a different question? It sounds like a different thing (though it could be the same thing. Hard to tell without looking at the product.) Can anyone works there speak Korean? Then ask for misutgaru. That should make everything clear! or You can send me the picture of the product then I will be able to tell you whether it’s the correct one. 🙂 You are very funny! I am glad that you found your answer. Though, I learnt something new from you. I didn’t know that raw grain is toxic. As far as I know I’ve never ate raw grains and probably never will! I really enjoy reading your blog and I have tried plenty of your recipes. I have a Korean husband and fell in love with Korean food instantly after he brought me to a Korean Restaurant for the first time 11 years ago when we were dating. 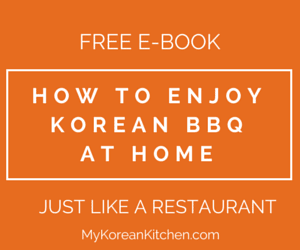 I am really glad that I found your site and I have tried most of the recipes and they really turn out well, my Korean husband also enjoy the food a lot. 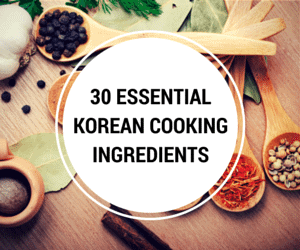 I am really happy that I finally can cook Korean food for my husband. 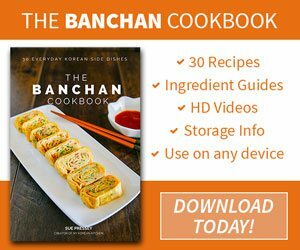 I am excited to know you are back online and looking forward to learn about Korean cooking and culture from you. Thank you so much for sharing! Thanks for the reminder of this drink. I totally forgot I had some of this powder until I read this post. Just gave it to my babies and they love it. Glad to see you back to blogging. Thanks Jessica, Glad your babies liked it! I think Misutgaru is so versatile that it will make a good baby formula. So sorry…when I said “my babies” I meant my kids. They’re 5, 4, and 2. 🙂 They haven’t been babies in a while…but I feel like they’re still babies. not sure how I stumbled onto your website but now I am a follower. Love your website. THANK YOU for the helpful info! I love this stuff — had it growing up and it’s hard to find one from a store that’s preservative free…. I will look in to getting it from a dduk jip. from Washington D.C. I am glad that you find the post informative. I hope you can find Misutgaru from your local rice cake store 떡집. Ooooh…this sounds so good!!! It sounds really similar to a sort of warm dessert we enjoy (we are HK Chinese). My favorite flavor is a black sesame blend, mixed with hot water and served as a dessert soup. (“Ji Ma Wu”) I’ll have to look for this!! !